Use tape or chalk to set up a grid with numbers 1-10. Children start by throwing a stone into the number 1 square. Children jump through the course, avoiding the square with the stone. 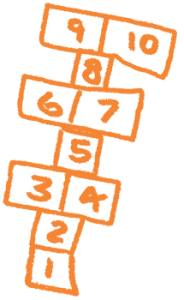 Once the child has reached the number 10 square, they turn around and head back to the starting point. When the get back to the square with the stone, the bend over to pick it up. The game repeats with the stone being thrown into squares 2-10. Have children jump with two feet rather than hop on one. Increase the number of squares.